(Courtesy of Karen and Carl Wheeler) A view of the Gentile Valley in Idaho, where some farmers are worried that Rocky Mountain Power's plans to store more water in Bear Lake could subject their farmlands along the Bear River to flooding — or even lead the electrical utility company to use eminent domain to take the properties from them. May brings the busy end of calving season at Carl Wheeler’s ranch in Thatcher, Idaho, when his cows give birth in lush meadows along the banks of the Bear River. With about 300 calves born there yearly, the riverside grasslands have been crucial to the Wheeler family’s ranching operations for over a century. So when Rocky Mountain Power officials approached Wheeler with an offer of $200,000 to take the meadows out of production, he declined. Selling the acreage, he said, would put him and future Wheeler generations out of business. The Wheelers and others in southeastern Idaho’s Gentile Valley find themselves in the crosshairs of new plans for managing the Bear River, as Rocky Mountain Power, Utah's largest provider of electricity, seeks increased flexibility to operate its dams on the river in response to real-time demand for power. But to do that, the utility needs to store more water in Bear Lake — and permission to flood riverside farms downstream, with the potential of putting ranchers like Wheeler out of a livelihood. Rocky Mountain Power first floated its plan about a year ago, when it touted the idea as a way to stave off expensive new water projects Utah has slated for the waterway. The added storage would let Rocky Mountain Power increase the amount of electricity it generates with a series of five Bear River dams, according to Jeff Richards, a vice president and attorney for the company. The new approach would also mean intermittent flooding on acres of active farmland along that section of the river northwest of Bear Lake. When Rocky Mountain Power approached farm owners with offers to buy their land, Wheeler and his neighbor John Mussler say company officials threatened to use powers of eminent domain to seize their property. Mussler said he and other Gentile Valley property owners, in turn, sought help from Idaho state officials in the matter. In doing so, they also tipped off officials at the Idaho Water Resource Board, which looped in folks at the Utah Department of Water Resources as well. In April, Utah and Idaho officials filed joint applications with water regulators in both states for control of 400,000 acre feet of water out of Bear Lake — a vast amount of water they believe would be made available for other uses if Rocky Mountain Power succeeds in its plans to secure additional storage. Idaho’s thinking goes something like this: Rocky Mountain Power, which also operates as PacifiCorp, seeks additional water to generate electricity, but is simply going to run it through turbines and release it downstream. To the Idaho Water Resource Board — an eight-member panel in charge of making and enforcing that state’s water policies — the utility’s new plan looks like it’s creating a new water source free for the taking. Whether or not Rocky Mountain Power agrees the water is free to use for other purposes depends, in large part, on whether the states’ water use would interfere with the utility’s ability to build a reserve of water in Bear Lake sufficient to meet its power-generating plans. The utility is on good terms with the states right now, said Richards, the company’s lawyer. But as recently as April, the company was prepared to fight what it saw as surprise proposals from Utah and Idaho seeking control of Bear Lake water, fearing the states’ moves could lead to the condemnation of PacifiCorp’s facilities on the lake. Rocky Mountain Power controls water flows into the lake from the Bear River through a series of canals it owns, Richards said, so for anyone to store additional water in Bear Lake, they would either have to do it with the utility’s cooperation, or force the utility to comply. The company is currently bound by decades of historic agreements that require it to keep the water level in Bear Lake within a certain range. Right now, that generally means the company releases water from Bear Lake in the fall to make room for water to be collected the next spring to prevent flooding downstream, particularly in the Gentile Valley. But the utility now believes that if it bought up flood-prone properties along the river and vacated them, managers would have more flexibility to store water in Bear Lake and use it as a sort of carbon-free back up, releasing water when the company needed extra electricity. This, in turn, could give the utility an option of ramping up hydropower generation — say, when its wind farms or solar arrays elsewhere aren’t making power — instead of having to fire up one of its natural gas power plants to make up for the loss. That is why the company began approaching farmers in the Gentile Valley about purchasing easements, Richards said, that would require land owners to keep animals and crops out of low-lying areas that could flood if Rocky Mountain Power sent a pulse of water down the river. He said company officials have mentioned eminent domain to the property owners involved, because that disclosure is required by law in the state of Idaho. But Rocky Mountain’s proposal has created another thorny issue on the Bear River system. Under the terms of historic operating agreements, the water Rocky Mountain Power releases from Bear Lake is to be used by downstream farmers to water their crops. The way the utility currently manages the lake limits when and how much water is available downstream. Idaho’s application to claim ownership of that 400,000 acre feet of stored water is primarily intended to protect existing property and water rights on the Bear River, said Roger Chase, chairman of the Idaho Water Resource Board. The Gentile Valley farmers, after all, brought the issue to their attention, Chase said. But, Idaho also saw the turn of events as a potential opportunity. Those other uses, according to applications filed by Utah and Idaho, may include delivering the water to cities and towns in Cache, Box Elder, Weber, Davis and Salt Lake counties in Utah, as well as Bear Lake, Caribou, Oneida and Franklin counties in Idaho. Patton, the Idaho water board’s executive officer, said growth in those Idaho counties has been slowed by the lack of available water. The entire Idaho side of Bear River drainage — including related groundwater — is managed like one continuous system. That means nobody can dig a new well in the area without having water to make up for it, because that well might use up ground water that could ultimately make its way to a Bear River farmer who has a right to use it to grow crops. Utah, of course, is also entitled to water from Bear Lake, which straddles the Utah-Idaho state line. So Idaho water authorities also reached out to their Utah counterparts and proposed to share the new Bear Lake water. Water officials in Salt Lake City “decided we needed to be involved in this to look at the best interest of the state of Utah,” said Todd Adams, deputy director of the Utah Division of Water Resources. Utah is still working out exactly how it would use its share of the additional water, Adams said. And although Utah and Idaho both filed applications to claim the 400,000 acre feet from Bear Lake in April, Adams said Utah officials don’t intend to move forward with the process until talking with stakeholders, including Rocky Mountain Power, who have expressed concern about the filing. 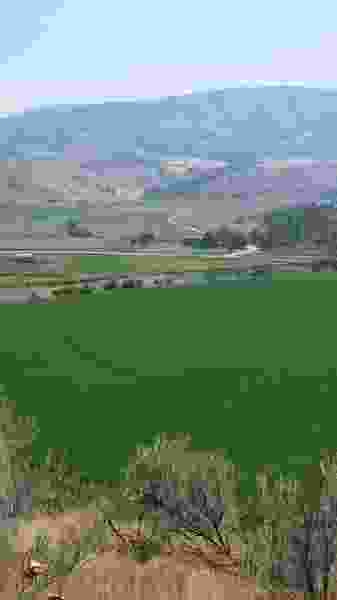 Idaho officials, however, have a pretty good idea how they would put the water to use, said Patton — they want to make it available to developers to spur economic growth. And officials in that state, he figures, might have a better shot than Rocky Mountain Power at obtaining the necessary flood easements in the Gentile Valley. But not everyone agrees that this 400,000 acre feet of water — roughly equivalent to what 400,000 suburban homes might use in a year — is actually up for grabs. Members of the Bear River Water Users Association have filed formal protests against both the Utah and Idaho applications, arguing that they, as irrigators — and not the states — are the rightful owners of any additional water to be had out of Bear Lake. Association members have contracts with Rocky Mountain Power that date back to the turn of the century, said Randy Budge, an attorney representing the association, and those pacts require the utility to supply water from Bear Lake for irrigation. The amount of water delivered is determined by how much water is in Bear Lake. In drier years, members get less irrigation water and when lake levels are higher, they’re supposed to get more. So as the water users association sees it, Budge said, those contracts suggest that any additional water made available from Bear Lake is already claimed. The association doesn’t object to the notion of obtaining flood easements along the Bear River and holding the lake higher if it makes more water available for irrigation, Budge said. In fact, he said, association members considered filing their own application to try to claim the water, but that proved cost prohibitive. Still, under historic agreements dating to the early 1900s, Bear River water users agreed to give longstanding water rights to PacifiCorp’s predecessor in exchange for a guarantee that once the water was done turning turbines and generating hydroelectricity, it would be made available to the irrigators for agricultural use. Farmers in the Gentile Valley, meanwhile, are amenable to making more water available from Bear Lake. But some worry that new water might be sold to the highest bidder — developers on Utah’s heavily populated Wasatch Front, for example — instead of being offered to them. But Wheeler — who said the offer Rocky Mountain Power made on his farmlands was competitive with what he could get on the open market — is simply not willing to sell.